Sean-o here. A slow start out of Shasta this AM as we pulled together our food and freshly washed clothes for the next stretch. Plus we loaded up on breakfast at the Best Western, packing on calories. Pan here : Our middle-aged, graying pony-tailed cabbie -- with a dream catcher depending from his rear view mirror, and ethereal Hindu-accented recorder music playing -- blessed us on our forward journey. Dionysus here: back up into the beautiful mountains. Mt Shasta towers over all the wrinkled landscape around it. The mountains we hike through all day never really get higher than 7500 ft. So our eyes are drawn over and over to the huge and snow-crowned volcano. What charisma this mountain has. 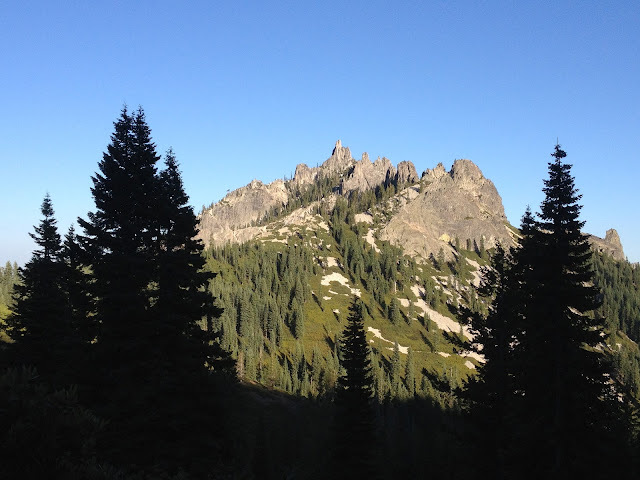 We continue to hike up and up until Castle Crags is actually at eye level and most of it down below. 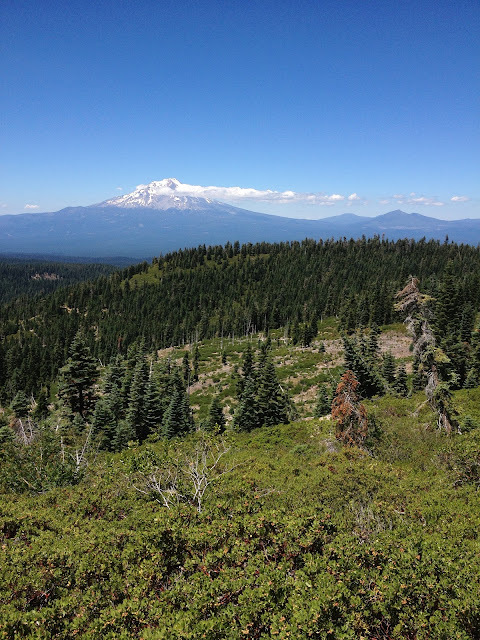 We find a dry camp (no water) high up on a mountain ridge with great views of Shasta. Data and some other hikers have set up their sleeping bags here and there. We set up ours. And read for a little while (laughing with our good Terry Pratchett). Thru-hiker eating dinner in his sleeping bag not far away. The sun has set. Shasta still has some last sunshine on it. The PCT passed up and around Castle Crags on the right and then onto the neighboring mountains up and up until we reached this ridge.